This is a wonderful article, very clear and organised. I will use this information to help me with Kiwi. I still am uncertain about how close a relationship I should establish as she's already experienced so much change in the past year and I don't plan to live here for more than a few more months. Perhaps I should just leave our relationship as is, do some work to make it safer for me to deal with her, and not establish a closer relationship that would lead to more crisis in her life. Types of Birds Owned: I live with a Senegal parrot. Needed to reread this and will be incorporating a lot these things into Pan's daily routine. He's developed very bad one person aggression - the favorite being me - so bad that I can't have him loose with guests out, since he'll run after them to bite them, lunging for faces, toes, hand, ect. He used to be tolerant of my younger sister and mother, allowing himself to be handeled, fed, and trained by them...when he saw them almost daily, but they've been losing contact and he just lunged aggressively at my sister today. I have a male blue front amazon that we rescued last year, we were told he was around 8 at the time. His previous owner was a young man in his 20''s and apparently he had him from a breeder the year before. He said that Janner was a mans bird and didn't like this guys girlfriend, but apparently never bit anyone. Initially all was good, he seemed to bond well with all of us, but showed favour to my husband who worked away and is only at home 10 days a month. About a month after having Janner he lunged at me one morning while I was changing his paper at the bottom of his cage. I think he was aiming for my eye but he actually got the part between my eyes, it was a big mess I was bleeding heavily and still have a scar a year later. Since then and despite the fact that I really didn't react, I get regular bites from Janner, most of the time they come when he is showing calm body language and totally unprovoked. I do everything for this bird, I clean the cage, feed him , spend all my days playing with him, I basically do everything for him and at times I feel the relationship is wonderful then suddenly out if the blue he lunges at me, literally chews on me then sits on his perch all day making a peeping sound. I really have no clue as to why he does this, he is very much loved and given the best we can but its almost like he won't let me get too close. My personal thoughts are that he doesn't like me cleaning his cage as most of the attacks happen when I am cleaning his cage, he has even charged at me when I'm cleaning my other birds cages, I now ensure he is out of the area but he knows I'm sure of it. As I say he loves my husband and even my kids, neither of them have ever had a bite. If a male friend comes in Janner immediately goes to them and shows them affection but if I try to take him off....look out my hands are toast. I have tried everything and after each bite he seems genuinely remorseful but as I say it s so unpredictable that for me I don't trust him, but for everyone else we have the model bird.....any tips would be gratefully received! Wowwww...you have probably answered every bird-related-one-person-ness question and everything else that I have ever wondered...you are amazing. My Sun Conure literally hates me!! If I go near her cage she will lunge with mouth open answer squawk frantically. I feed her and clean her cage. I talk to her give her treats but she wants none of it. I can't get her to step up on my finger. When I first got her she was so nice and loved pettings. Now she's all about my husband. He doesn't feed her or anything to do with her. He comes around her and no squaring he can get her to step up....she will even dance to him talking. What have I done wrong?? dixie323 wrote: My Sun Conure literally hates me!! If I go near her cage she will lunge with mouth open answer squawk frantically. I feed her and clean her cage. I talk to her give her treats but she wants none of it. I can't get her to step up on my finger. When I first got her she was so nice and loved pettings. Now she's all about my husband. He doesn't feed her or anything to do with her. He comes around her and no squaring he can get her to step up....she will even dance to him talking. What have I done wrong?? You did nothing wrong. We have very little idea of what goes through these "bird brains". I can only tell you what has happened with me. I rescued Rambo and though he took my home by storm and accepted everyone I was his #1 human for years. #1-me, #2-Grandma and #3-Aunt Betty who he used for amusement and scared her whenever possible. When my daughter moved in, Rambo changed the order of importance and Rachel took #1 and I slid back to #3. "Grandma" passed in 2014. Rambo knew she was not well and spent his days every day with her. It took him a long time to accept that Grandma went "bye byes" and did not come back. He called for her every once in a while until we moved. Though he called her Aunt Betty he tried to claim her as a grandma but it took her a while to adjust because he had caused her so much trouble. In the mean time my daughter took a job that caused her to be out of town all week. Weeks went by and Rambo decided to make me #1 when Rachel was not home but still climbed up to be on Aunt Betty's chair now and then. Like I said, these guys are deep thinkers and we can only go with the flow. Accept the relationship that you have and limit your time with him. Focus on the others and he will eventually accept you as #1 when you are the only one. You have done nothing wrong for this to happen as no one knows how or why any parrot chooses their human or mates. We do know that it has nothing to do with who takes care of them or which human loves them the most. I would just keep showing the bird that you are the bringer of good things and continue to work on winning his trust. even if he doesn't change his favorite person to you he may still accept you as part of his flock and you can still have a good relationship with him. It just takes longer. Yep, both Liz and Wolf are correct. Parrots are like people when it comes to falling in love and as the French says: 'Le coeur a raisons que la raison ne connait!' (the heart has reasons that reason doesn't know of). Your parrot has chosen your husband and you are the competition for his love. BUT you can make things better and I'll tell you how. First, you need to make sure the bird is not hormonal and, for this, you need to keep it to a strict solar schedule with full exposure to dawn and dusk and not free-feed high protein (if you are already doing this, just skip this paragraph). So no filling up the bowl in the morning with pellets or seeds, it need to eat something like gloop or chop for breakfast (check the diet section) and get just a measured amount of high protein food (pellets, seeds, nuts, nutriberries, avicakes, etc) for his dinner (and whatever is left over after he goes to sleep, you take away). Then you need to allow the bird to fly around (flying dissipates sexual hormones from their bloodstream and distracts them). You don't need to ask him to step up for this, just open the cage and walk away. If you do this a couple of hours before you serve his dinner (I am turning off the overhead lights and giving them dinner at 3:30 pm this time of the year) and did not give him high protein in the morning, he will go back into his cage on his own. Then you need to show him that you are not competition so do not hug, kiss or even touch your husband in front of him. 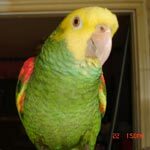 Parrots are very jealous of their mates and do not put up with any nonsense when it comes to them so, although it sounds extreme, believe me when I tell you it works. He needs to regard you as a flock mate and, for that, you need to interact with him on his terms so let him out of his cage without asking him for any physical interaction with you, talk, sing, whistle even dance for him but do not try to touch him. Offer him a treat every now and then but, if he doesn't take it from your fingers, just leave it near him and walk away (the treat should not be a 'bribe' but a 'gift'). Now, if he has been kept at a human light schedule and fed high protein all the time, it's going to take months for him to adjust to the seasons and, unfortunately, this is not the best time of the year to do it because we are nearing the winter solstice when the days start becoming longer preparing for the breeding season but you need to start doing it at one point or another and the sooner the better. He may never call you Momma but he will learn to depend on you which will make you a valuable person in his eyes.